Discussion in 'vBench (Works in Progress)' started by MarquisMini, Mar 16, 2017. Here are more cavalry troops who served as part of the King's Household cavalry. 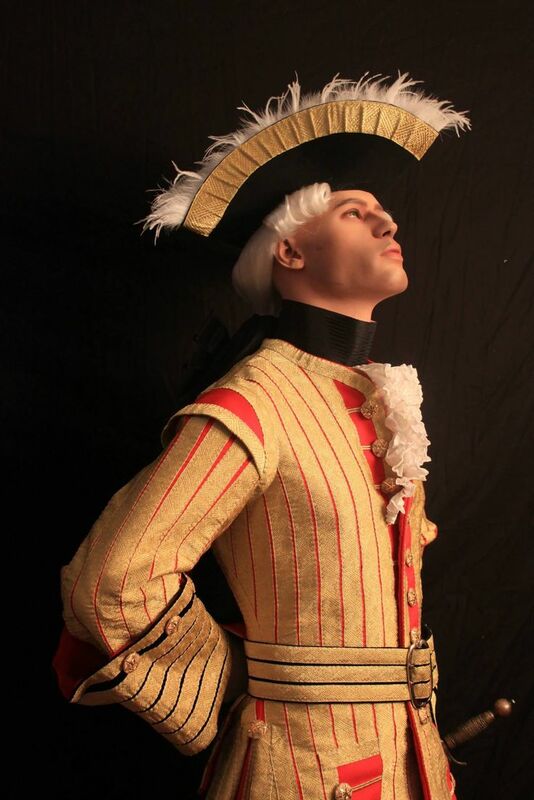 This corps was raised in about 1611, their uniform was an all red coat and troussers, lacing in gold , cuffs were in black velvet with gold lace. The vest was leather buff with gold lace, after 1740's changed to a buff cloth with gold lace. The Gendarmes had gold buttons and gold lace on their hats garnished with white plumes, the only difference on the uniform with the company of Chevaux Légéres was that the light horse company had the same uniform but their buttons were silver, the gold lace was the same but at the buttonholes were mixed with silver and the lace on their hats had a mix of silver and gold, somewhat complicated, but hey, you k ow these Frenchies dominated fashion for centuries. The company had 19 officers and about 200 Nco's and troopers. They all ride bays except for officers who rode grey horses. They had trumpeters unlike the Mousquetaires who were supossed to be on foot and mounted , so they had drummers only. peedee, stoffy01, Jaybo and 5 others like this. peedee, stoffy01, napoleonpeart and 6 others like this. These will be a nice grouping Daniel. Tell me is it unusual for the trumpeter to have the red coats at this time? peedee, anstontyke, Borek and 1 other person like this. thanks Keith, actually, the trumpetters and kettle drummers had lace all over the coat!. It almost look like yellow with little red. Oda, stoffy01, Jaybo and 5 others like this. Other great group of figures... Lot of work and collectibles joy in your threads . It is as i thought it might be Daniel. Thank you. I am working on a long term 200 mm project with with a similar coat. You have some great pictures for reference Mate. These three will be a bit special when you have finished. peedee, Borek and anstontyke like this. Thanks my friend, i will have to do some mods on this trumpeter since he is a dragon Trumpeter, there were none available for the gendarmes from Front rank, all i need to do is getting rid of the pointy lace on the cuffs and make them all horizontal around the cuffs, and get rid of the turn down collars. Thanks for watching and always great to have you here. Always a joy to see your work. Thx. You are very prolific Daniel, with an interesting and informative story line to go with the development of your dioramas. Very educational and great reference material. As Paulo says, always a joy to see your work, and tremendous painting on such a small scale. Looking forward to the next instalment. Thanks for your kind words Chris, i am glad you like it. I finished all the mods on the trumpeter. Got rid of the turn down collar and built the open coat at the top with the ruffle shurt cravat protruding from it, added some neck stock , the banner for the trumpet, the false wings on its shoulders and the false pocket , some illustrations show 3 buttons , some shows 4. I just decided to go with 3. Jaybo, napoleonpeart, Borek and 2 others like this. peedee, Don Johnson, Oda and 5 others like this. Very colourful and very impressive work , as Keith says "going to be a bit special"
peedee, anstontyke, MarquisMini and 1 other person like this. Thanks Kev, yes, thes eguys were 'La créme de la créme' with respect to uniform appearence and status. peedee, napoleonpeart and anstontyke like this. peedee, Oda, napoleonpeart and 2 others like this. Finished this trumpeter coat, painstaking process.., an di am glad it's done. Next it will be the face and hair, then adding the edge of the banner. peedee, Oda, Borek and 2 others like this.